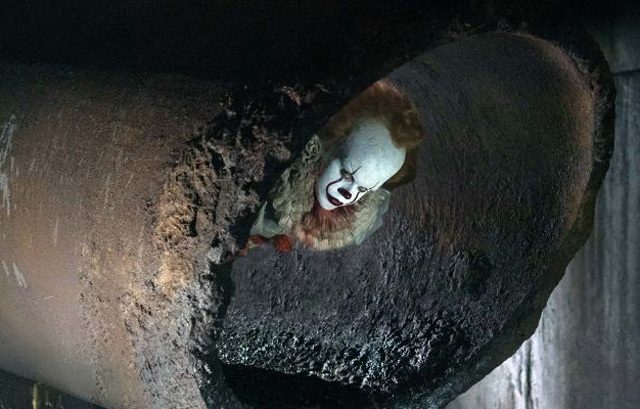 New Line Cinema‘s new adaptation of Stephen King’s IT is currently in post-production, and EW has revealed a terrifying new Pennywise photo. You can check out the photo in the gallery below! Mama helmer Andy Muschietti is directing the film, which stars Bill Skarsgård as Pennywise, Jaeden Lieberher (Midnight Special) as Bill Denbrough, Finn Wolfhard (Stranger Things) as Richie Tozier, newcomer Sophia Lillis as Beverly Marsh, Jack Dylan Grazer (Tales of Halloween) as Stan Uris, Wyatt Oleff (Guardians of the Galaxy) as Eddie Kaspbrak, Chosen Jacobs (Hawaii Five-0) as Mike Hanlon, and Jeremy Ray Taylor (42) as Ben Hanscom. The film is based on the novel by Stephen King, whose story recalls a promise made 28 years ago that forces seven adults to reunite in Derry, Maine, where as teenagers they battled an evil creature that preyed on the city’s children. Unsure that their Losers Club had vanquished the creature all those years ago, the seven had vowed to return to Derry if IT should ever reappear. Now, children are being murdered again and their repressed memories of that summer return as they prepare to do battle with the monster lurking in Derry’s sewers once more. The film is expected to be released in two parts, with Part One focusing on the group of teens called the Losers Club, while Part Two is set around the repercussions on these characters as adults. The first film will be released in theaters on September 8, 2017. The remake is being produced by Dan Lin, Roy Lee, Seth Grahame-Smith and David Katzenberg. IT was previously adapted into a television miniseries in 1990 from director Tommy Lee Wallace and featured Tim Curry’s iconic performance as the title character.